Hello and welcome to our live coverage of stage 3 of the 2018 Tour of Britain. We're in for another hilly day and more GC action after yesterday's shakeup. Bardiani-CSF's Alessandro Tonelli is in the race lead, and the Italian will have a job on his hands if he's to hold off the likes of Julian Alaphilippe (Quick Step Floors) today. 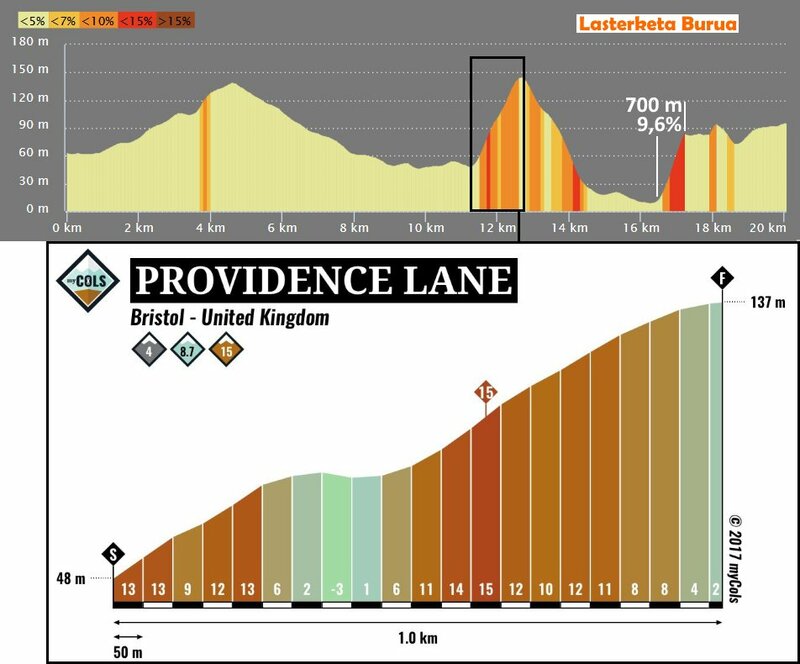 Today's stage, which starts and finishes in Bristol, will begin in around 20 minutes, with the official start coming quarter of an hour later at 11:45 UK time. We're in for a fast and furious day today, with the stage measuring in at just 127.2km. Three categorised climbs are packed in along the way though, including the famous Cheddar Gorge after 38.5km. The real tests will come in the closing 20km though, with an uncategorised climb followed by the category one Providence Lane and then another uncategorised hill in the closing kilometres. Cameron Meyer (Mitchelton-Scott) won yesterday's stage, as the breakaway eluded a powerful chase group including the likes of Julian Alaphilippe and Wout Poels, among others. The Australian outsprinted Tonelli to claim the win, his first on the road in 2018. There were prizes for two of the other men in the break too, with Scott Davies (Dimension Data) taking the KOM jersey and Matthew Teggart (Team Wiggins) donning the sprints jersey. Here's what the general classification looks like heading into the stage. There are a lot of big hitters up there – names that we can expect to see on the offensive today too. Meyer is leading the race for the points jersey, though he, André Greipel (Lotto-Soudal) and Wout Poels (Team Sky) are all on 15 points. Davies has a commanding lead in the KOM classification, with his 26 points besting Alaphilippe and teammate Nic Dlamini's 15. Teggart's 9 points yesterday mean he leads Matthew Bostock (Great Britain) by 2 points in the sprint competition. Hugh Carthy (EF-Drapac) is currently the best British rider, while Quick Step Floors unsurprisingly lead the team competition. The riders will be climbing en route to the start proper, which should come in around 15 minutes. There are no hills early on today, though, but the break will no doubt look to establish themselves before the first of three intermediate sprints at Yatton after 17.9km. The riders pass over the famous Clifton Suspension Bridge. In a few hours they'll be back here, just 2km from the day's finish. And we're off! The flag has dropped and stage 3 is officially underway. Stefan Küng (BMC) is the first man on the attack, racing away immediately. Of course, the British domestic squads are looking to get in on the action too, with several teams represented towards the front as around 12 riders get a small gap. That move didn't stick – it was too big and therefore too dangerous to let go. Fernando Gaviria (Quick Step Floors) tries a dig off the front. He was on the attack late in yesterday's stage too. Jon Mould (JLT-Condor) is trying a move now. Nobody has joined him but Gaviria is leading the chase from the peloton. Alex Dowsett (Katusha-Alpecin) is the next rider to take off. Still no moves have been successful. Direct Énergie are very active on the front early on, shutting down several moves so far and sending Sylvain Chavanel on the attack at one point. Now it's Max Schachmann's (Quick Step Floors) turn to have a go. The peloton is lined out behind him, and nobody is able to get a gap. Mitchelton-Scott have several riders at the rear of the peloton, including yesterday's stage winner Cameron Meyer. Curious. One Pro Cycling haven't made a break so far during the race. They have riders up front and are keen to make the day's move. The peloton is still all together as we get within 1km of the first intermediate sprint of the day. Emils Liepins (One Pro Cycling) has got a small gap on the peloton, but Katusha-Alpecin are out in force on the front. It looked like Patrick Bevin (BMC) beat Mads Würtz Schmidt (Katusha-Alpecin) to that intermediate sprint. If so, it means a three-second bonus for the Irishman. There's not long now until the first climb of the day, the fourth category climb to Shipham. Maybe we'll see the break of the day launched there. We're approaching the 100km to go mark and still no break has been established. Liepins and Mould are trying again. We're on the climb now. Schachmann, Maarten Wynants (LottoNL-Jumbo) and James Shaw (Lotto-Soudal) have broken away from the peloton. More riders are trying to make it across to the trio, including Taylor Phinney (EF-Drapac). James Shaw takes the points at the summit of the climb. That break group was brought back at the top of the climb and now Tejay Van Garderen (BMC) is having a go. Shaw beat Schachmann and Wynants to the KOM. Just the 3, 2 and points for the trio. Van Garderen has Tony Martin (Katusha-Alpecin) for company. The duo are descending a few seconds ahead of the peloton. We're on the second climb of the day now, the second category Cheddar Gorge. The climb is toughest early on, with a maximum gradient of 16% in places before easing off to 4-6% after 2km. Schachmann, Strakhov and a Team Sunweb are off the front of the peloton now. Riders are being distanced from the back of the peloton as the gradient bites. Several other riders have made it across to the lead group now. Turns out that it doesn't really matter who made that group because the peloton has just brought them back. Still no breakaway, despite Schachmann trying yet again to get away. Chavanel attacks! The Frenchman gets a decent gap straight away. Bardiani-CSF have tried to control things, but race leader Tonelli is their only man left at the head of the peloton now. 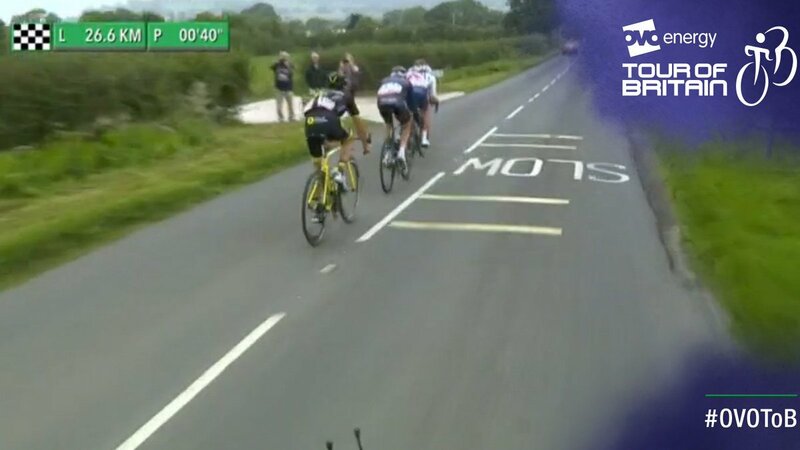 And Chavanel takes the maximum 8 points over the top of Cheddar Gorge before dropping back to the peloton. Gaviria has leapt out of the peloton, and they seem quite content to let the Colombian sprinter ride off. He won't be pleased to see nobody else following, though. And predictably Gaviria is brought back as a Direct Énergie rider pushes on. We have a breakaway! Four men have finally broken free from the peloton. They are Pascal Eenkhoorn (LottoNL-Jumbo), André Greipel (Lotto-Soudal), Romain Cardis (Direct-Énergie) and Matthew Holmes (Madison-Geneis). Maximiliano Richeze (Quick Step Floors) and Jay Thomason (Dimension Data) are chasing. The chase duo have been brought back, while the four-man break have a gap of just 15 seconds. It looks like the break is going to brought back. TEn seconds is the gap now. Iljo Keisse (Quick Step Floors) and Jasha Sütterlin (Movistar) clip away from the peloton. The Movistar rider was actually Rubén Fernández. In any case, he and Keisse have made it across to the Greipel group. Here's a shot of the breakaway. Strakhov has gone on the attack once again, trying to bridge up to the break. Strakhov makes it across. There are now four riders up front who lie just 49 seconds off the race lead – Strakhov, Eenkhoorn, Fernández and Holmes. Now Keisse is trying to split the break up with an attack. Their advantage is still small, just 40 seconds at the moment. We're just a couple of kilometres from the day's second intermediate sprint at Midsomer Norton. Bardiani-CSF have a rider on the front of the peloton, while Sky are a big presence there too. They're working to keep the gap to the break small. It's under 30 seconds now. Eenkhoorn take the sprint alone. Strakhov and Fernández took second and third. The peloton is just ten seconds behind now, and will probably bring the group back soon. The terrain is up and down from here on in, though just one classified climb remains – Providence Lane with 9km to go. And the break is caught. Alex Dowsett (Katusha-Alpecin) immediately goes on the attack. Now Dowsett's teammate Tony Martin has gone clear solo. He's over 12 minutes down so maybe he'll be allowed to go. Martin is powering along, arms draped over the drops. The gap is edging out, but the peloton still have him in their sights as more riders try to get off the front. Three more riders have joined Martin up front. They are Jon Mould (JLT-Condor), Angelo Tulik (Direct Énergie) and Ben Swift (Great Britain). The four-man break now has a minute over the peloton. Quick Step Floors are working on the front of the peloton. Ben Swift is the best-placed man on GC in the break. He lies 3:32 behind race leader Tonelli. The other three are all over 12 minutes down. We're inside the final 40km now and the break has a 40-second advantage. They won't make it to the finish. The gap to the break is now nearing a minute as they approach the final intermediate sprint of the day at Bishop Sutton. Mould leads the break over the sprint, which was uncontested. Tulik and Martin took the remaining points and seconds. The gap is coming down now, as we reach the sharp end of the stage. There is one unclassified climb left on the profile, starting with 20km to go. Then it's just the category one climb of Providence Lane and the climb to the finish on Clifton Down in Bristol. The lead quartet are still plugging along, dutifully ignoring the warnings painted onto the road. Maximilian Schachmann, who has been one of the most active riders of the day, is riding at the front of the peloton for his Quick Step Floors leaders Bob Jungels and Julian Alaphilippe. We're into the final 20km now. The gap is coming down by the kilometre. Quick Step Floors are still working at the front of the peloton, with BMC there as well. Here's the official profile of today's final categorised climb, which will start in just under 5km. It's a tough one. And here's the profile on the climb and finale from Lasterketa Burua. Note the steep unclassified climb just a few kilometres from the finish. The break reaches the final 10km and Providence Hill is almost upon them. The peloton is bearing down fast, though, laying just 15 seconds down the road. Great Britain move to the front of the peloton, despite having Swift up front. The break is almost caught, in any case. Game over for the break with 9km to go. We're on the climb now. EF-Drapac, Great Britain and BMC are all represented at the front of the peloton. Fernando Gaviria is once again up front, trying a dig on the climb. The Colombian has a small gap on the peloton, maybe a few seconds. The peloton is shattering on the steep slopes. BMC pull Gaviria back. Tom Pidcock (Team Wiggins) goes on the attack solo. Bob Jungels (Quick Step Floors) makes his move behind Pidcock, who takes the points at the summit. What remains of the peloton is lined out on the descent, with Pidcock at the head. Jungels leads them down now, what remains of the peloton is all together. Kiryienka takes it up on the front now. Caleb Ewan (Mitchelton-Scott) is still up there. Race leader Tonelli is back in the peloton. 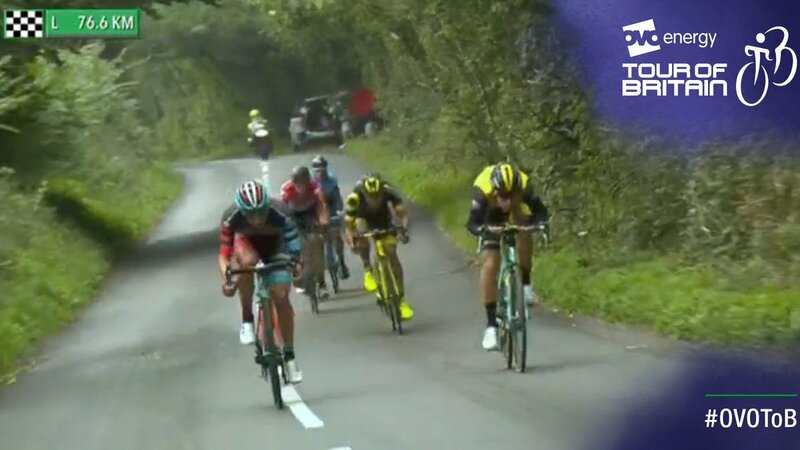 Neilson Powless (LottoNL-Jumbo) is among those at the front of the peloton as they hit the short, steep unclassified climb in Bristol. Van Garderen and Bevin are there for BMC too. Hugh Carthy (EF-Drapac) goes on the offensive, opening up a small gap. And we're back where we started – on Clifton Suspension Bridge. Van Garderen chases down Carthy. BMC are still at the front of the peloton as we head into the final 2km. Final kilometre! James Shaw leads the peloton now. Jungels and Alaphilippe take over. Final 500 metres and Quick Step are still on the front. Mads Würtz Schmidt opens the sprint early! But it's Alaphilippe who takes advantage of Jungels' leadout to nip through and take it! Julian Alaphilippe (Quick Step Floors) wins stage 3 of the Tour of Britain! Meanwhile, race leader Tonelli was dropped and will lose the green jersey today. He was almost a minute down on Alaphilippe. Alaphilippe jumped onto the wheel of Würtz Schmidt after the Katusha man took it up early. Patrick Bevin (BMC) took second, while Emils Liepins (One Pro Cycling) seemed to finish third. Patrick Bevin (BMC) is the new race leader! Bevin picked up two bonus seconds at the first intermediate sprint of the day, then six more at the finish. Meyer once again loses out on the leader's jersey on countback. I'm really, really happy like always when we win, but especially today because we tried from the start of the race and today it was a good opportunity [for that]. The team did a great job all day, controlling the race – especially in the final. With Bob [Jungels] we were trying to attack, or go in the sprint with me. In the end he did a perfect leadout. I was really happy to finish the job of my team with a nice victory. We knew it was another stage with a tough finish. The idea was to get over that last KOM in a good position and then fight in the sprint. It was a really hard sprint, and it all happened in slow motion. Unfortunately I didn't have the legs to overcome Julian [Alaphilippe]. It was really hard – the break didn't go until 70km in and I managed to pick up a few seconds in one of the intermediate sprints. It was a tough day - these roads just sap the legs and no matter what you're just being drained. There are now just 25 riders within a minute of the race lead, including stage winner Julian Alaphilippe, his Quick Step Floors teammate Bob Jungels, and Primož Roglič of LottoNL-Jumbo. That trio are looking like the biggest favourites for overall victory, with a summit finish and team time trial still to come. Tomorrow the peloton head to the Midlands for a stage from Nuneaton to Royal Leamington Spa. It's a bit lumpy, but nothing like the last two days, so a sprint finish seems the most likely outcome. The green leader's jersey isn't the only one to change hands today, from Tonelli to Bevin. Alaphilippe takes the lead in the points classification and will wear a darker shade of blue tomorrow. Elsewhere, Scott Davies (Dimension Data) keeps the black KOM jersey, and Matthew Teggart (Team Wiggins) retains the red intermediate sprints jersey. And that's it from me today. See you in the same place tomorrow at the slightly earlier time of 11am UK time for live coverage of stage 4!